Always an important thing to take proper care of. Last thing anyone needs is to lose control of one of the most vital parts of a vehicle. Traveling during the summer can wear down the layers on the brake pads leaving them dangerously thin. Now is the time to make sure they’re ready for the difficult conditions that come with slick roads. Speaking of dealing with slick roads, tires are extremely important to look into before the fall season. 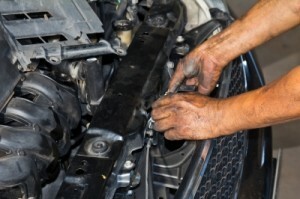 Check for any edge wear, center wear, or shoulder wear to see if you have any trouble spots on your car. It’s also a good time to check to make sure the air pressure in all the tires is at the proper levels. Make sure your spare is also good to go. The extreme New York heat can have severe effects on a battery. It shortens the life and is a principle reason for a car dying in the middle of winter, at the worst possible time no less. Give the battery a look over to see if there’s any cracks in the case. Take it from someone who was once caught in a blizzard with broken wiper blades, it’s not fun. Make sure they’re doing what they’re supposed to do and that’s keeping the road visible. Not usually something that most drivers consider when readying their vehicle for fall driving. With chillier weather also comes the dreaded potholes and they can do a number on the ill-prepared motorist. This is something regardless of the approaching fall season that should always be checked into. Make sure you’re meeting your regular intervals of oil changes to make sure that it doesn’t negatively impact your vehicle during colder weather. Low or dirty fluids can wreak havoc on your engine. Again, something that should always be taken care of. Make certain the fluids on things such as power-steering , transmission, brake, windshield fluid are at factory recommend levels. It’s also a good time to check on the anti-freeze levels. These are supposed to be replaced at regular intervals, so just make sure you’re doing that and if it is that time, then there is no better time than now to do it. Having bad air flow can lead to negative consequences on your engine and even on the amount of gas your engine is consuming on a trip. Having a new filter will do wonders for your gas mileage and help your engine last longer. With the fall season approaching, so are longer nights. During the tail end of the year, you’ll find yourself driving much more during darker portions and for that reason it’s good to make sure that other drivers can see you easily. Give both the front and the back lamps a good look at to make sure they are functioning properly and optimally. There you have it, a good start to ensuring your car is ready for whatever weather the final part of the year will bring. If you need any help with any of this maintenance, make sure to contact the service department at Bayside Chrysler Jeep Dodge. We’ll make sure your car is ready for the weather.